Kait McIntyre speaks on victory over Boeing | Fight Back! 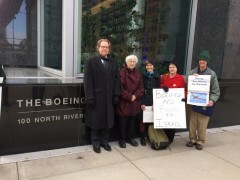 Chicago, IL – At a Feb. 29 press conference held in front of the Boeing Company Headquarters, Kait McIntyre, former Boeing board candidate and member of the Anti War Committee (Chicago) spoke on the decision of the Securities and Exchange Commission forcing Boeing to allow a shareholder vote on a resolution that would force the corporation to detail its arms sales to Israel. Gwen Farey of 8th Day Center and the Midwest Coalition of Responsible Investment also spoke at the event. "I want to thank everyone for coming and everyone who participated in the collaboration that produced this shareholder proposal. Upon receiving this proposal, Boeing initially said the proposal could not be included because too few shareholders care about weapons sales to Israel. However, we found this inconsistent with the fact that in 2014, during Operation Protective Edge, millions of people across the globe protested against Israel’s assault on Gaza and the occupation of Palestine. This included a demonstration in Chicago that had over 10,000 people. 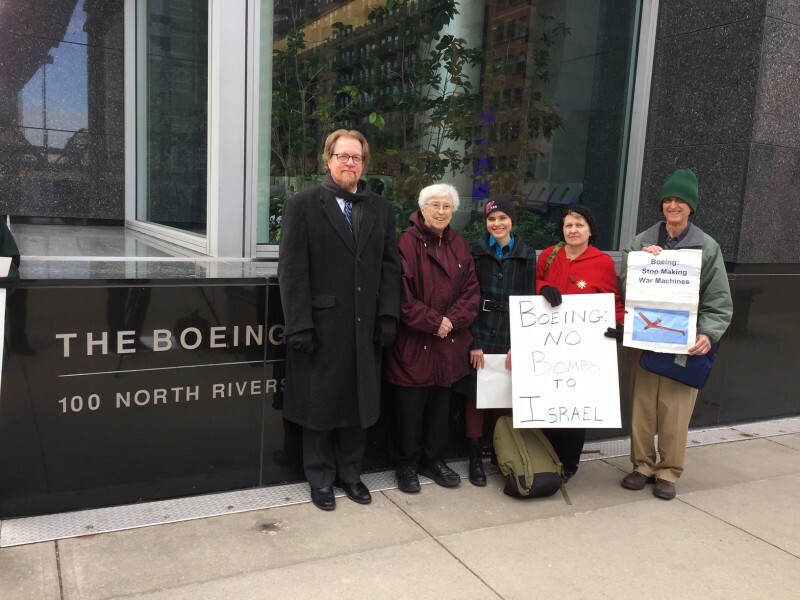 “We find Boeing’s view inconsistent with the fact that over seven universities in the U.S. have passed divestment resolutions including Boeing, due to Boeing’s weapons sales to Israel, including most recently the University of Illinois-Chicago. Sodastream, a company targeted by the Boycott, Divestment, Sanctions movement for operating a factory in illegal settlements in the West Bank, experienced a significant tumble in their share price in 2015 due to having to move to a new plant. We feel shareholders have the right to know that this kind of pressure and its consequences on stock value may impact Boeing if it continues to sell arms to Israel that aid its unpopular and brutal occupation. “Amnesty International published a report on Israel’s war crimes during Operation Protective Edge that included use of bombs consistent with the MK-84. Boeing’s Joint Direct Attack Munitions (JDAM) kits are what make the MK-84 a guided weapon. On July 23 2014, 24 doctors and scientists published an open letter in a renown medical journal stating, ‘In the aggression of Gaza by Israel…we witnessed targeted weaponry used indiscriminately and on children and we constantly see that so called intelligent weapons fail to be precise, unless they are deliberately used to destroy innocent lives.’ This can only reflect poorly on Boeing - either their product does not work effectively or they are selling their product to war criminals. Yet, in spite of this, in May 2015, Boeing agreed to a contract to provide more JDAMs to Israel. “However, our proposal wasn’t demanding an end to weapons sales to Israel, although I feel that, morally, Israel’s slaughter of thousands of Palestinians in a 50 day period, including over 500 children and over 250 women, warrants this demand. Our proposal was merely asking for transparency regarding Boeing’s weapons sales to Israel to allow other shareholders to evaluate and decide for themselves. But Boeing refused to allow even this small amount of democracy. Boeing felt justified in deciding unilaterally what shareholders do and do not care about and even went as far as excluding our proposal because it did not fit within their vision. “It was only when they were forced to by the Securities and Exchange Commission that they included the proposal. We plan on making the most of this opportunity to not only educate shareholders but educate the community as well. We will unite those opposed to the occupation and opposed to those who profit from it and deliver a strong message at the shareholders’ meeting this spring despite Boeing's desire to silence us and to keep shareholders in the dark about the doings of the company they bought stock in."